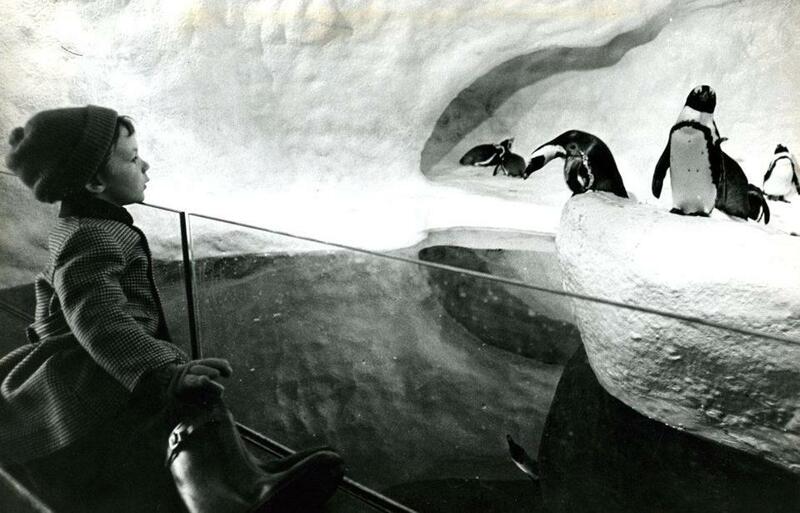 February 26, 1973: Stephen Genthe, 5, from Newark, New Jersey, enjoyed the antics of the penguins on their fake snowy “icebergs.” Ten black-footed penguins were shipped from South Africa to the aquarium for the opening in 1969. The birds, which cost $80 each, took a two-day flight without food or water. They would have become ill if fed or watered in flight. By the time this photo was taken, they were well-accustomed to their new home in Boston. The New England Aquarium opened in the summer of 1969. The city had been without an aquarium for 15 years since the previous aquatic museum in South Boston closed in 1954. It is hard to believe this oceanfront city was without such an important staple for so long. The aquarium was part of the waterfront urban renewal plan that transformed central wharf. The popular attraction itself has gone through many changes. A ship called Discovery that housed a sea mammal pavilion was once docked next to the museum where dolphins and sea lions performed. A new wing in 1998 included an outdoor harbor seal exhibit, and the IMAX theater was added in 2001. It will be curious to see what new life and developments are on the horizon for this home of interesting ocean dwellers.